On this date in 1453, Ottoman Grand Vizier Çandarli Halil Pasha (or Chandarly) was put to death, the first time anyone holding that office had suffered such a fate. 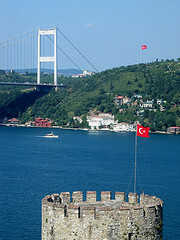 In Istanbul, Halil Pasha tower — part of the siegeworks used to take Constantinople — overlooks Fatih Sultan Mehmet Bridge, named for the man who ordered Halil Pasha’s death. It was a stunning fall for the man who had presented himself in the sultan’s council just six days before to argue for discontinuing the seven-week-old Ottoman siege of Byzantine Constantinople. This siege would succeed, on May 29, in conquering the second Rome, and it may have been Halil Pasha‘s longstanding opposition to this project so glorious for the rising Ottomans that cost him his life. Halil Pasha’s enormous personal wealth, which made his family both a potential rival and a source of confiscated revenues badly needed by the state. Personal rivalry with the sultan now known as Mehmed the Conqueror, whom Halil Pasha had deposed in the former’s childhood in favor of his retired father when exigencies of state required a more experienced hand. A generation gap with the sultan’s younger advisors. Both Ottoman and Christian sources recorded charges that he was in league with Byzantium’s defenders; even if not true in a literally treasonous sense, the veteran statesman had relationships with Christians through Constantinople and (as evidenced by his opposition to the siege) likely had more to lose than to gain from Mehmed’s aggressive foreign policy. Especially in the last respect, Chandarly Halil Pasha’s death turned over a leaf in Europe’s complex relationship with the rising Turks. And among those inclined to view a clash of civilizations between the Christian and Muslim worlds, the May 29, 1453 Ottoman conquest of Constantinople rates as a day just as weighty for the fate of the world as for that of Halil Pasha himself.